A simply gorgeous, delicately feminine perfume potion with a very specific purpose...for the marriage minded amongst us! The ingredients in this potion have come down in folklore throughout the ages as those that put men into a 'marital' frame of mind. Nearly 20 love attracting, commitment encouraging ingredients in all, such as Daffodil for assuring that your love is returned; Orange Blossom for eternal love and marriage - and a magnet for men; Neroli for sensuality and encouraging a shy lover; Peach for marriage, fertility, happiness and abundance; Sweet Dill for love and protectiveness; Basil for love, fidelity and empathy between lovers, Hyacinth for love, joy and the easing of childbirth, Sweet Pea for lasting pleasure and blissfulness; Pansy to ensure that your lover will yearn to be by your side when separated from you; Lotus, because no man can refuse a woman who wears it, and more... This potion tends to bring out the chivalrous side of men, and seems to inspire in them the desire to treat you like a treasure. DAFFODIL ~ Regard, sympathy and affection returned, love, fertility, luck. ORANGE BLOSSOM ~ Strong "magnet" to attract men, eternal love, marriage, fruitfulness, thoughtfulness, happiness, tribute. NEROLI ~ Relieves tension and anxiety. SWEET DILL ~ Attracts women, love, protection of the home, affluence, good fortune. SWEET PEA ~ Lasting pleasure, blissfulness, youthful attraction, friendship, courage, strength. PANSY ~ Draws love, ensures your lover will think of you when separated, divination. BASIL ~ Love, fidelity, empathy between lovers. 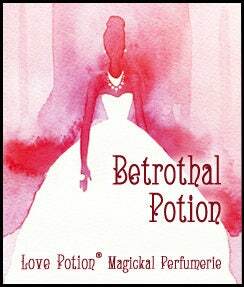 Betrothal Potion is a part of our Permanent Collection.